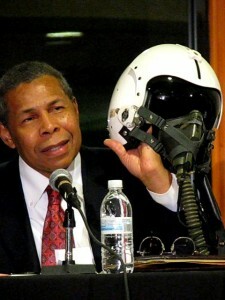 The lecture entitled “The Sky is Not the Limit” focused on the legacy of African Americans in aviation and aerospace. The panelists included an original Tuskegee Airman — one of the pioneering African American soldiers who flew in World War II. The panelists talked about how they got interested in becoming pilots and how it was for African American pilots during their service in the U.S military. They also discussed the Robbins History Museum, formerly the Robbins Airport, which was the first African American-owned and operated airport in the U.S. and which was the training facility for many of the 996 Tuskegee Airmen. They also shared their views about the small number of Black aviators today, and gave some advice to male and female African American pilots in the audience on how to obtain financial assistance to further their careers. Tuskegee Airman Marshall Knox, a 92-year-old flight instructor and aviation enthusiast who is the former president of the Black Pilots of America, said he was inspired to become an aviator when he saw a blimp in the air while he was a youngster living in Robbins, located in Chicago’s South suburbs. Another panelist was Bill Winston, the founder and pastor of Living Word Christian Center in Forest Park, who was born in Tuskegee, Alabama, and served in the U.S. Air Force as a fighter pilot. Winston received numerous awards and medals, including the Distinguished Flying Cross, the Air Medal for Performance in Combat, and the Squadron Top Gun Pilot, and said he was first influenced to go into aviation when he saw how the father of a girl he had a crush on — who was a U.S. Army general— looked in his flight uniform. Winston also recalled how, as a second or third grader, his own father took him on Sundays to his job as a civil air patroller to watch pilots fly their planes. Winston is also the founder of Golden Eagle Aviation and Shell Aviation Fuel Provider, servicing pilots and private aircraft, located at the historic Moton Field in Tuskegee, Alabama. 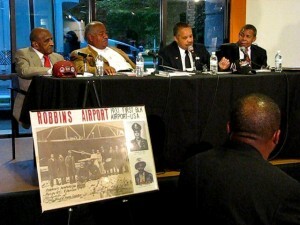 Tyrone Haymore, the director and co-founder of the Robbins History Museum, who is not an aviator, talked about the nature of the Robbins Airport and its role in the development of Black aviators, including the Tuskegee Airmen. Haymore recounted some of the “unforgotten, untold, and swept under the rug to be buried information” about the Robbins Airport. Built in 1931, it was started by two pioneers in aviation, John C. Robinson, known as the “Brown Condor of Ethiopia,” the first Black American to own and operate a commercial airlines, and Cornelius R. Coffey, the first Black to hold both a pilot’s and a mechanic’s license, according to information on the Blackhawk Flight Foundation web site and related sites. “What these two men did was absolutely remarkable,” Haymore declared to the audience. Haymore added that he knew Coffey the last 10 years of his life. He was still flying in his 90s, still working as an aviation mechanic, and still certifying for the FAA inspectors. “He never walked with a cane, and I don’t remember seeing him wear eyeglasses either,” Haymore said of Coffey. 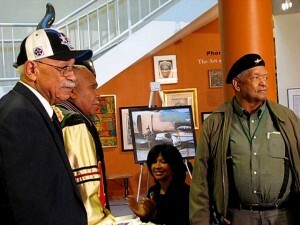 Some of the artifacts on display at the museum include photographs portraying the city’s rich history of Black aviators, including the uniform worn by Simone Robinson, the first Black woman aviator killed in military action, who was from Robbins, and the last uniform worn by actress Nichelle Nichols, who played Lt. Uhura on the original “Star Trek” television series. During the question and answer period of the lecture, Reggie Dunlap, a Black pilot with United Airlines since 1987, spoke about the current status of African Americans in aviation. He told a tale about how Black pilots were unfairly treated, including Jim Edwards, a retired Black pilot with United Airlines, who sued the airline for discriminatory hiring practices. “Jim had to sue United Airlines as a second Black pilot because he got out of Vietnam having flown eight-engine B-52 Bomber Jets. United rejected him at the job and they were hiring pilots off the street with no hours,” he said. Dunlap, who began flying at the age of 16, talked about the contributions of the Tuskegee Airmen and other Black aviators. “When I go out to schools and I try to talk to young people…I say ‘You know what, the groundwork is laid. There’s not going to be an n-word next to your name. There’s not going to be people hiding your flight bag. All that’s over with,” he said. Dunlap added that just one or two percent of the pilots in the airline industry are African American. A special tribute was also given to some Chicago-area Tuskegee Airmen, as well as their descendants, who attended the event. The living legends in attendance included Shelby Westbrook, Olot Wikerson, Julius Echoles and LeVern Shelton. Barbara Allen, the producer of the WTTW-TV film “From DuSable to Obama,” was also in the house as well as a few young Black female aviators, including Tamara Holmes, who started her own aviation and consulting company. 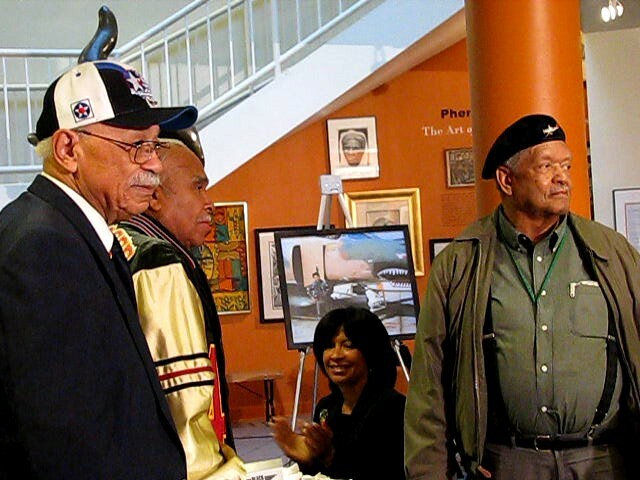 The event was held in conjunction with the exhibition “Black Wings: American Dreams of Flight” currently on display at the DuSable Museum, 740 East 56th Place, through Sept. 25. The exhibition was organized by the Smithsonian Institution Traveling Exhibition Services. This entry was posted	on Thursday, September 22nd, 2011 at 5:05 pm. You can follow any responses to this entry through the RSS 2.0 feed. You can leave a response, or trackback from your own site.